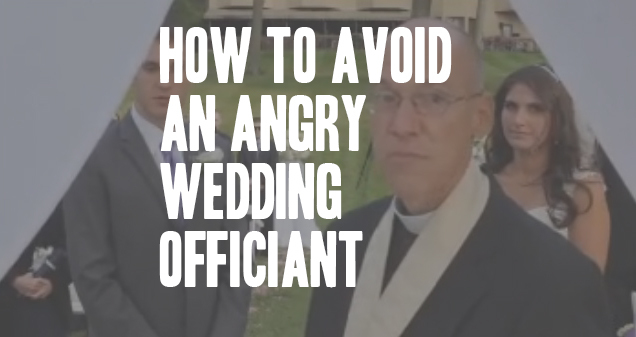 This video was posted on The Knot yesterday and although I have never had an experience quite this terrifying, I have dealt with a some difficult officiants, wedding coordinators and churches. I've found a couple of simple steps can help avoid these wedding day mishaps. Many churches have established photography policies, it's important for you (and your photographer) to know and understand these policies. When choosing a wedding venue, ask if they have specific wedding photography policies. It's a great idea to sit down with your photographer and talk through the policy, some of the guidelines may interfere with the shooting style of your photographer, it's important to understand these things before your wedding day! These policies can also effect your wedding day schedule, so make sure to keep that in mind as well! Understanding your officiant's style is key to the tone of your wedding day—check out this great list of 10 Questions to Ask Your Officiant. In addition to these questions, it's a great idea to ask about your officiant's photography policies as well. Some officiants are very flexible and are not bothered by the photographers, other officiants want to preserve the significance of the wedding ceremony and avoid distractions such as flashes and moving photographers. It's important for your photographer to know what your photography preferences are as well. If you would like your ceremony photos to have a more intimate and close feel, your photographer will need to be very close to the front of the sanctuary, this usually means sitting among your wedding guests, while this creates beautiful photos, it can also be somewhat distracting to your guests to have the clicking of the camera in their ears. As a photographer, I strive to always be professional and respectful of the bride and groom, the guests of the wedding and the officiant. A wedding day is definitely not about me as a photographer—it is my job to help make your day be as beautiful as it can be! Having a clear idea of the photography policy of your venue and the preferences of the officiant and most importantly you as the couple can help you avoid a wedding day mishap like the couple from this video! Newer PostBest Wishes to Giulia & Chris on their Big Day!